The restaurant at Schloss Schonbrunn, a former summer residence of the Austrian royal family. 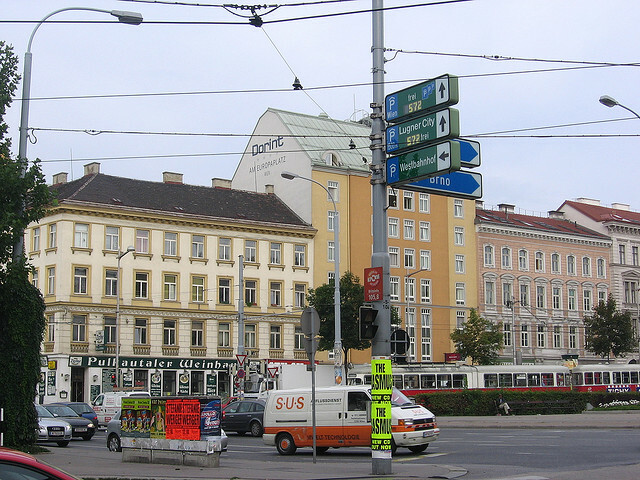 In September of 2005, I was in Vienna, Austria. My main reason for visiting was a romantic one: movie characters Jesse and Celine spent a whole night talking throughout the city in 1995’s Before Sunrise, and I wanted to see what they saw and walk where they walked. This film inspired me to backpack through Europe by myself, to hop on trains bound for other countries, and start up conversations with strangers. Here, friends, is a photo essay of my few days touring Vienna: dining alone in a fancy hotel, visiting an imperial palace, attending the Vienna Philharmonic Orchestra, and riding the Wiener Reisenrad, a huge Ferris wheel featured in Before Sunrise (it was just as magical as I’d hoped it would be). 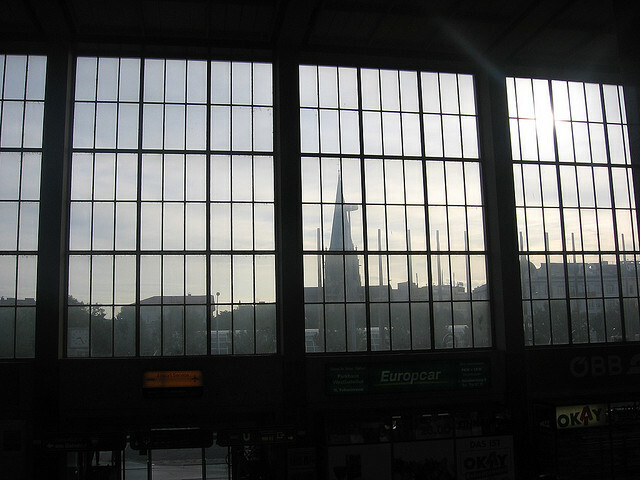 My first glimpse of Vienna when I disembarked on to the train platform: I was delighted. From the train station, I made my way though the streets, blindly picking a hostel out of my Let’s Go: Europe book. 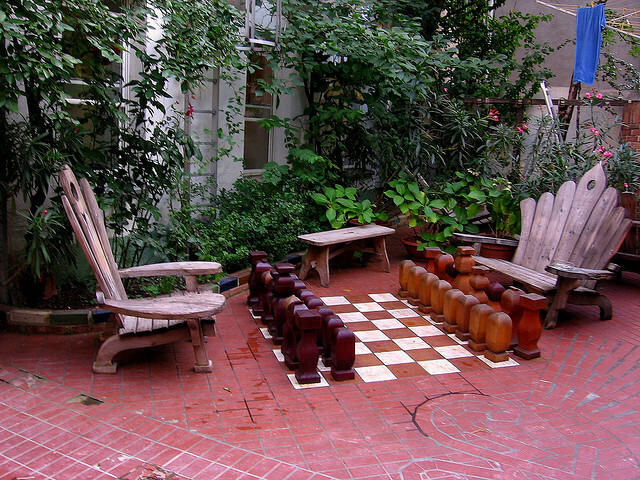 In the courtyard of Hostel Ruthensteiner- a giant chess set! Chess is one of the things that unites people across cultures. 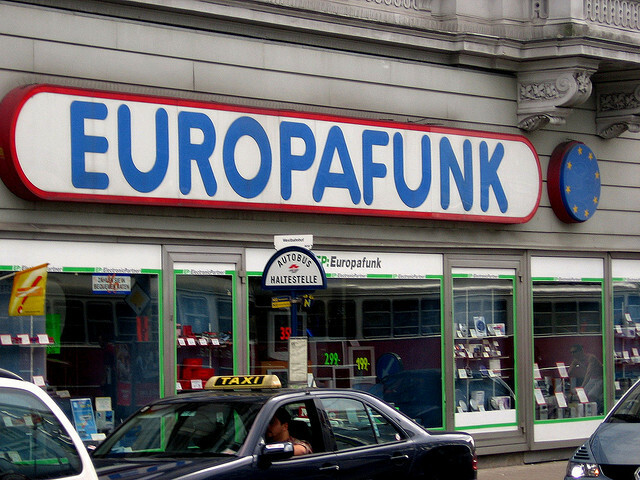 I squealed when I saw this sign: it was one of the first things in Vienna that I recognized from the movie. From there it was on to the Prater, Vienna’s amusement park. When I first watched Before Sunrise, I thought that the Ferris wheel they rode was the coolest one I’d ever seen: it didn’t have ordinary little cars that you sit in, it has gondolas for standing. Each one can probably hold a dozen people. It’s so much fun going from end to end for the different city views from each window. 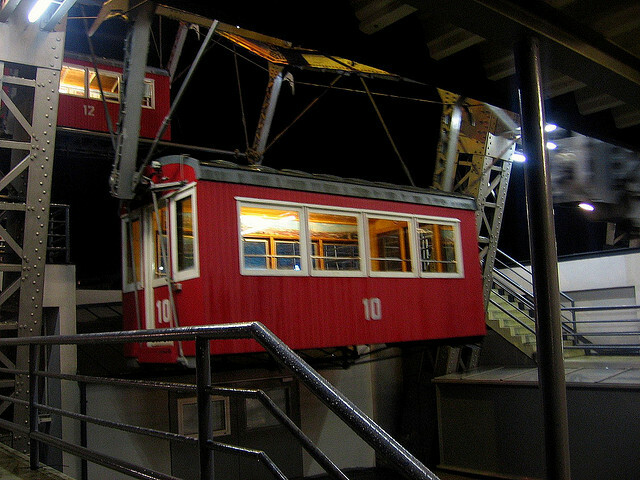 My gondola awaits! How cool is that? 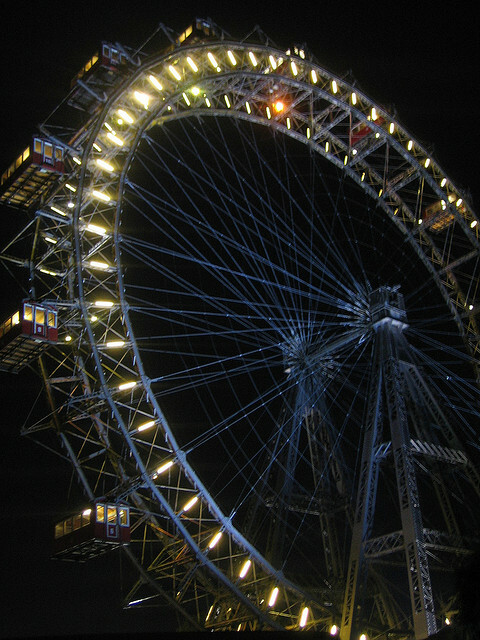 Wiener Reisenrad, Vienna’s Giant Ferris Wheel. Built in 1897. 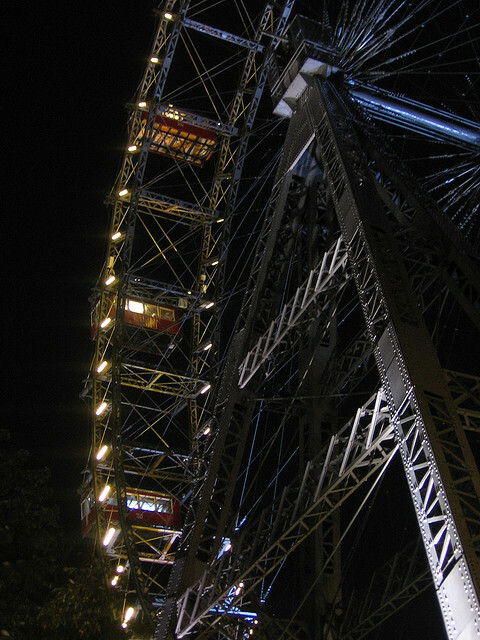 The Wheel is 64.75 meters tall and 60.96 meters in diameter. It was the world’s tallest Ferris wheel from 1920-1985. 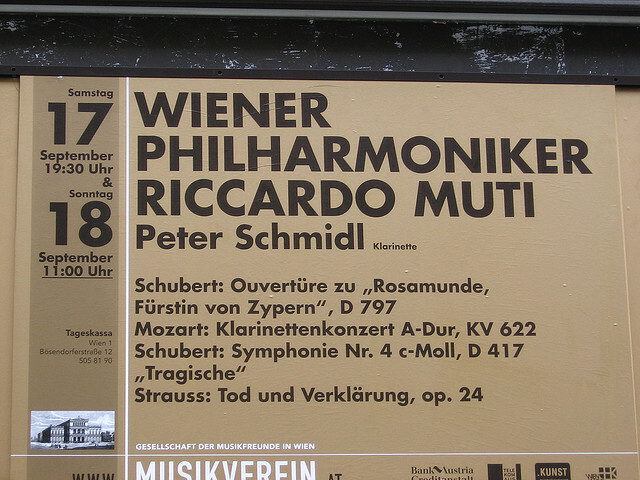 The next day, I had plans to see the Vienna Philharmonic Orchestra perform. I’m not some huge orchestra buff, but Vienna’s is quite famous, and the standing section tickets weren’t expensive at all. 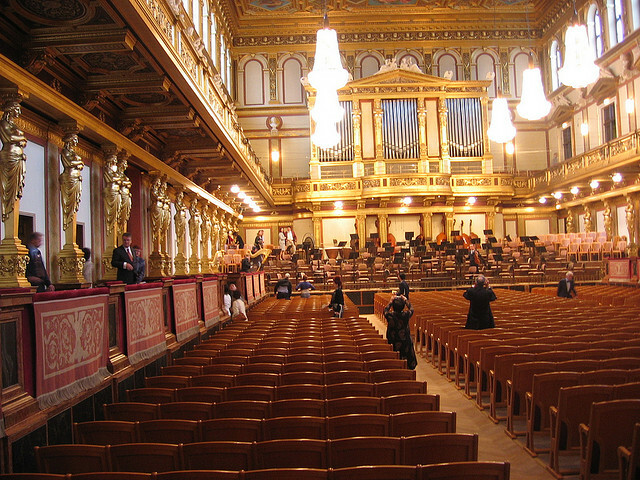 The hall, called the Musikverein, was resplendent, as ornate as could be. Once again, I felt under-dressed, but it was so crowded I don’t think anyone even noticed me. Wiener = Viennese. It was so nice being able to read a lot of signs, since English and German are so closely related. I hung around after the concert was over to sneak in this photo. Gorgeous! 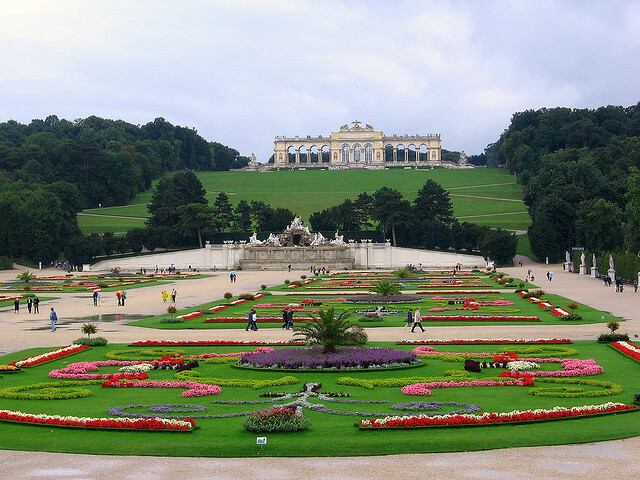 My one other big attraction in Vienna was Schloss Schonbrunn, or Schonbrunn Palace. 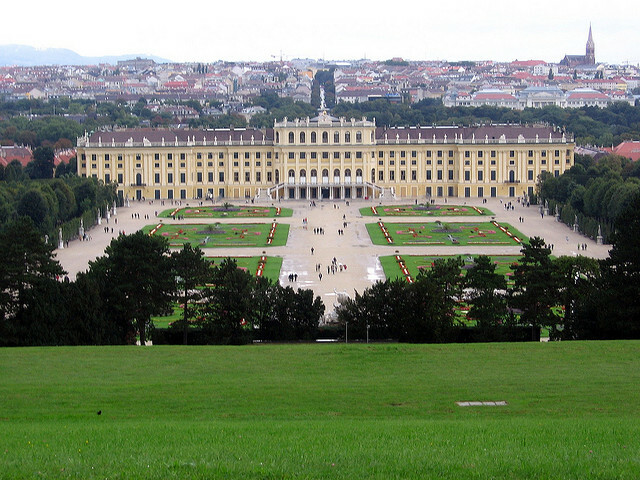 It was once used as a summer residence of the Austrian monarchy and has over 1,400 rooms (!!). Unfortunately, there were no photos allowed inside the building, but there was plenty to capture once I explored the gardens on my own. 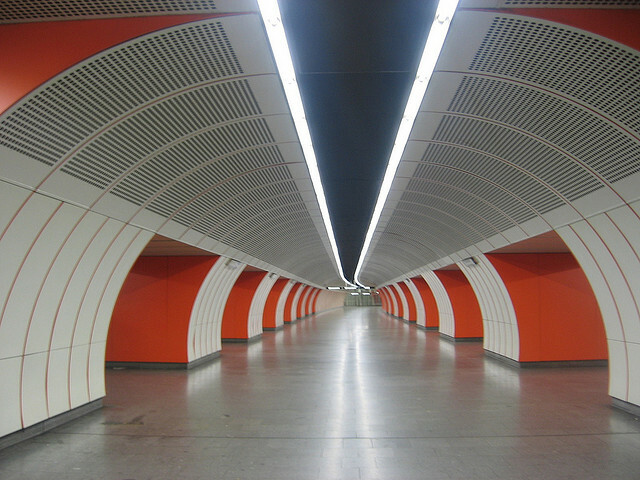 First, though, check out this subway tunnel! I felt as though I’d walked onto the set of a 70’s sci-fi film. After a quick ride across the rainy city, I arrived at the palace. The view of the palace and city beyond was magnificent as I stood on a hill in the back gardens. 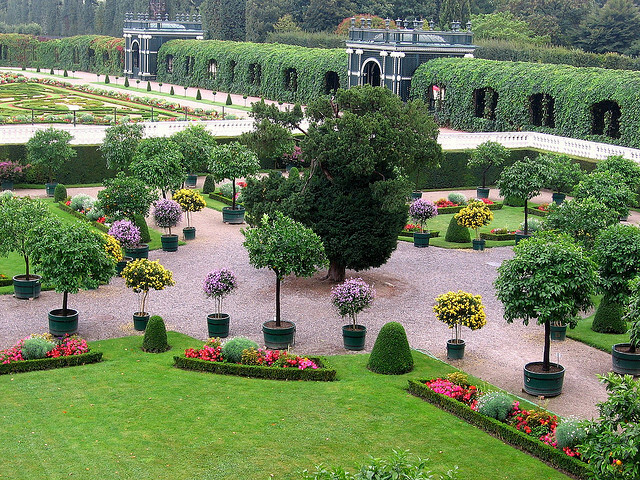 Just a small fraction of the lovely French garden, planned in 1695. The view standing in back of the palace looking across the gardens and up a 200 foot hill, to the Gloriette (seen in the topmost photo in this post). 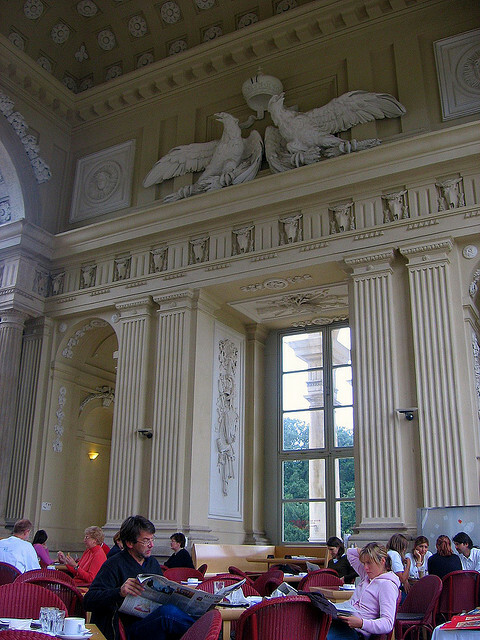 The Gloriette at Schonbrunn Palace has a café inside, where the wait staff was content to let patrons idle at their tables as long as they liked, sipping on delicious lattes and gazing at the imposing surroundings. I tried not to draw attention to myself by taking pictures, but I couldn’t help it. I was constantly in awe of the art & architecture everywhere I looked in Vienna, and this 239-year-old building was no exception. 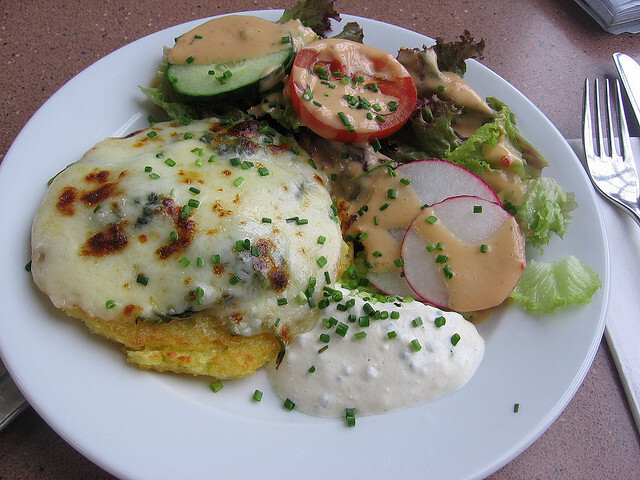 My lunch at Cafe Gloriette: an omelet? I remember choosing it because it was one of the few vegetarian options I could find on the menu. I also remember that it was delicious. Oh my goodness. I truly hope to visit Vienna again. What I did see was incredible, but it was only a tiny part of such a marvelous city. Jesse: Would you be in Paris by now, if you hadn’t gotten off the train with me? Celine: No, not yet. What would you be doing? Jesse: I’d probably be hanging around the airport, reading old magazines, crying in my coffee cause you didn’t come with me. Celine: Aww…actually, I think I’d probably have gotten off the train in Salzburg with someone else. Jesse: Oh, yeah? Oh, I see. So, I’m just that dumb American momentarily decorating your blank canvas. Celine: I’m having a great time. So now I think I might have to take her to Vienna. I love that you know the movie! There *is* so much to see here in the U.S., I’ve barely even spent time in the whole middle of the country myself. Of course now I’m imagining you and Scarlett sightseeing around Vienna together and those are some photos I would love to see! That palace is just gorgeous. Wow. And I love the first photo of it with the church behind it on the hill. So pretty! Hi Christy – Stopping by from the SITS challenge to say Hi and have a look around! (Tried to comment on your post in the Tribe — but for some reason no comments allowed.) Wanted to say that Vienna is one of my most favorite cities — such a beautiful place and everyone was so friendly! Loved it! Looking forward to reading more of your posts! Hey, Charlene, nice to meet you! I’m confused about the forum issue- there weren’t any settings that I saw that would prevent anyone from leaving comments…I’ll take it to the group! Vienna *is* so beautiful. I’ve been thinking about it nonstop today, when it hadn’t even crossed my mind for several years! I loved Vienna! You took me way, way back to 2001 when I was there backpacking. I saw the Philharmonic and was in awe with all the architecture of the city. 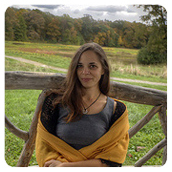 You photos are gorgeous! Funny you mention that movie. I saw the latest installment when they are in Greece and it reminded me of how we travel with them throughout the years. Such a sweet love story! First of all thanks for coming by today. Secondly, those pictures are breath taking. Having never been outside the US I love seeing foreign places through the lens of people just like me. I have never seen that movie so I may have to find it and watch it now. You’re so welcome and I really appreciate your visit and comment, too! 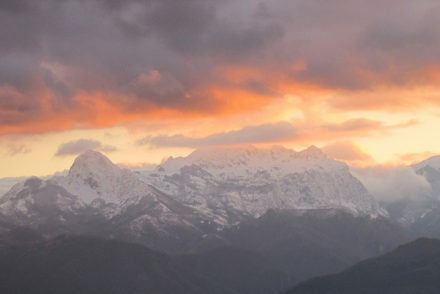 I love to share my photos & where I’ve been- it never ceases to amaze me how much there is to see in the world. Seriously, I got a degree in music and have longed to visit Vienna my entire life. Thanks for the tour. It looks awesome! You’re welcome, Ro and thank you for stopping by- glad I could give you a little vicarious trip to Vienna! 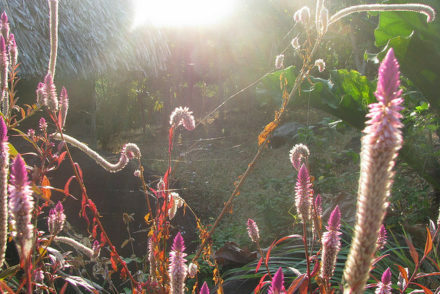 Your blog lately makes me want to quit school and succumb to my intense wanderlust! The world is seriously such a beautiful place. It astounds me everything it has to offer. Your mini tour has me swooning! Haha I’m all in favor of inspiring wanderlust and encouraging travel. Just graduate high school first, then the world is your oyster! 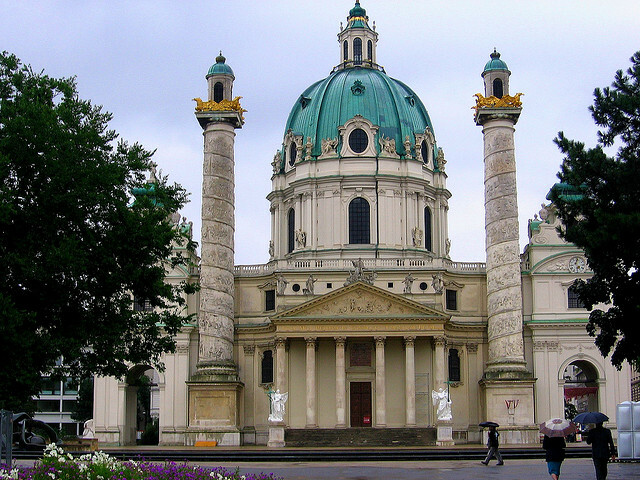 Christy, you make Vienna look so dreamy! I’ve never been but I have a soft spot in my heart for all things German. I would love to visit someday! Your photos are beautiful and I love that based on a small part of a movie, you took off on an adventure. When/where is your next trip? Hi Carla, thank you for your comment! I wish I knew when my next trip will be. My traveling has significantly slowed down since getting married two years ago- hoping we can save up the money soon, though. 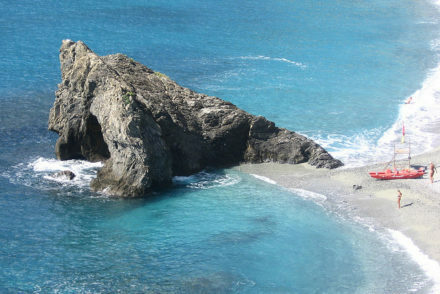 Until then, I relive my past travels here on the blog pretty often. Hi there Christy, dropping in from Sits Girls Tribe. Sorry late getting round everyone but it has been a really busy week which I just didn’t expect. 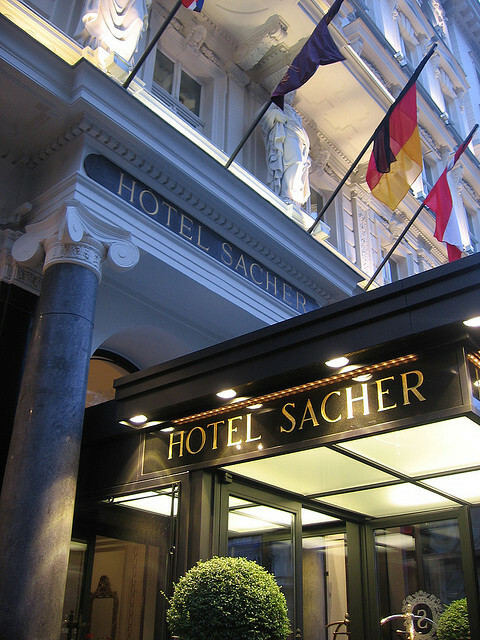 My husband and I were in Vienna in 2010 and I loved it. It was winter time and it just seemed like a warm city even though the weather was very cold. Hey, no worries, Sandra! I bet Vienna would be stunning in the winter and can’t wait to visit again, this time *with* my husband. Vienna was one of my grandparents’ favorite cities to visit (they did a great deal of traveling after retiring), so even though I’ve never been there it holds a spot in my heart. I hope one day to visit Europe myself. Thanks for coming by and joining the conversation, Nadine 🙂 I hope that you can get to Vienna someday, too! All I can say is: I love Vienna! 🙂 This post really brought me back there! Such a great post. 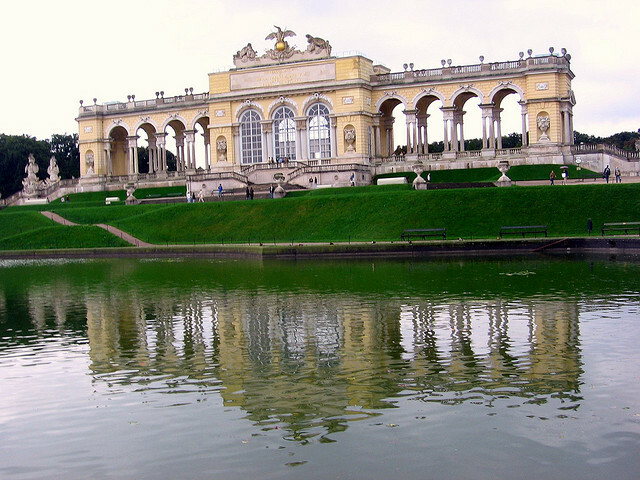 I loved Vienna when I visited there. Sadly I haven’t been in a very long time. Thanks, Barbara! I’d love to go back, too, but it’s so hard returning to places when I know there’s so many other places I *haven’t* seen yet! Thank you so much, Christine. This was certainly a dream come true for me, as cliche as it sounds! I love that your dad is encouraging you to watch it, haha. Do it, then watch Before Sunset, which takes place in Paris and I think is even better than the first one.